Artwork for this article provided by Julian399 and used with permission. 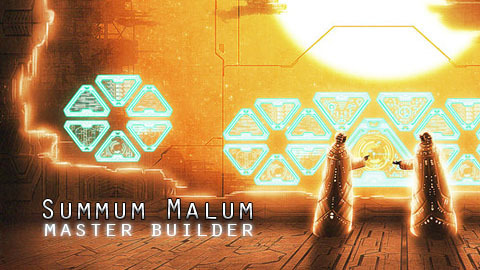 Summum Malum is our attempt to pinpoint the possible identity of the threat the Master Chief will face during the events of the Reclaimer trilogy. As of this moment, we have very little concrete information about the events of Halo and onward except for the fact that, during the events of Halo 4, the Master Chief will come face to face with a new enemy – an “ancient evil” possibly locked up in the mysterious world of “Requiem” seen during the Legendary ending of the original Halo trilogy. With little new information to go on, we must scour what we currently have and draw our early conclusions and thankfully the fictional universe of Halo has presented us with a number of likely, and unlikely, possibilities. How like gods and devils everywhere–Forerunners scheming, lying, denying their firmly held principles. The Master Builder’s cold fury built until I thought he would call for pain projectors to surround us all. […] Looking upon his face, I wondered what resources he had acquired upon his rise. He did not seem wiser for all that, only more powerful, more cruel. Faber–often referred to by his title of Master Builder–may be a dark horse for a Halo 4 baddie, but the once-powerful Forerunner makes a lot of sense to threaten the status quo in the Milky Way. If you look at the possible rogues’ gallery for 343i’s upcoming trilogy like a suspect in a murder investigation, you find that Faber has means, motive, and opportunity to menace the Chief and everyone else–a golden triangle of malevolence. Means — He built the Halos, and knows how to use them. Faber designed the Halos after the conclusion of the Forerunner-Human War as weapons of mass destruction. Threatened by the specter of the Flood, the Forerunner Council greenlit Faber’s 12-ring Array over the objections of the Prometheans and the Didact [Cryptum, C12]. Begrudgingly, Faber’s weapons became harbors of a sort to study the Flood and preserve other species through the Libraries. But Faber wasn’t about to let the Council interfere with his vision. Players have only explored the merest fraction of any of the Halo installations, and despite a basic idea of how the rings work, much is still not understood. Moreover, Faber’s control over the construction of the Halo Array via a single guild means that some aspects of the ring’s design might have been deliberately hidden from the other members of the Council. It’s hard to imagine what more damage a Halo could do than the annihilation of a large chunk of sentient life, but Faber’s ambition, sense of superiority and ruthlessness wouldn’t mean something worse is out of the question. The Dyson Shell of Halo 4 bears more resemblance to the Shield Worlds we know were the Didact’s chosen defensive measure, but as of yet we don’t know enough to tell who built Requiem. Motive — He’s really, really pissed off. From Faber’s point of view, everyone has betrayed him–the Didact, for opposing his final solution; the Librarian, for undermining said solution; Mendicant Bias, for being corrupted by the Flood; the Primordial, for using him for its own purposes; and the Forerunner Council and perhaps whole rates of Forerunner, for stripping him of his position and rank. Suffice it to say, he might be holding a wee bit of a grudge. Cryptum shows Faber has little love for any other species, particularly humans, and his actions have been considered barbarous by his own kind. His antagonism towards the Chief and Covenant would be understandable–especially towards the Reclaimers who would deign to inherit the Forerunner’s place in the galaxy once again. Though the UNSC and Covenant ultimately dealt a crushing blow to the Flood, the Parasite is likely still a threat, and Faber might push for his final solution now that there is no Council to stop him. Opportunity — He’s been awol for 100,000 years. As far as Chakas–and apparently the Didact/Bornstellar–know at the end of Primordium, Faber was killed on Installation 07 in the ensuing chaos of Mendicant Bias’ attack on the Forerunner capitol [Primordium, C42P374]. But there is room to doubt that account. Perhaps he’s spent the last millennia holed up, safe from the Halo effect (if someone knew how to avoid obliteration, it would be him), plotting for his ultimate return like all good villains. Why he has waited so long is unknown–but perhaps the failsafe misfire of the Halos and the Ark brought him back. In the face of the apparent death of his kind and the desecration of his legacy by lesser species, it just might be time for the Master Builder to go on the warpath and show what the true wrath of the Forerunners looks like. very interesting theory. I hadn’t even thought of that. If this is true, and the Master Builer does go on a rampage, then the best defense against him might be the Keyship, which if I’m not mistaken should still be on Earth. Food for thought! Truth used the Keyship to flee through the portal/the Ark. It’s never made clear where he lands, but presumably the Keyship remains at the Ark, whether intact or damaged by the ring’s firing. This makes sense, at least for one game. I wonder how he’ll tie into the whole precursor story…they DID say they’d be back right about now. Perhaps in the end he’s working for them. It would also explain why if we WERE fighting his band of forerunners, they wouldn’t be as much of a lopsided challenge as you’d think since all the warrior-servants would rally under Didact…a potential ally. Potentially plausible: the Array operates on via neural physics, a technology perfected by the Precursors; they would easily help him with the construction of the Array. Master Builder or not, the Array is complex; intervention by even a single Precursor would be a great aid. The Timeless One also may have had a subtle hand in influencing its construction, enough to manipulate the Array’s construction and activation to destroy the Forerunners. This is certainly an intriguing idea. If anyone could escape the halo, it would be him. However, his suit could not keep him alive so many millennia so I came up with two possibilities. One, he could be on a shield world where time is slower then time outside the shield world. Second, could he be in stasis on some shield world or forerunner building, with weapons of mass destruction at his side, but you cannot wake yourself up from stasis nor would he be desperate to wake himself up every so many years to check if the universe is ready for the taking. So could there be a second antagonist who readies the war machines and awakens the Master Builder? Or the Composer has turned him into a machine. Almost all of this is going over my head, does anyone have a picture book for this? I mean, I get the gist; it’s just that I don’t know anything about more than half of what was named (Keyship, Didact, Bornsteller…etc). Perhaps giving a little synopsis for each character/place wouldn’t hurt. I agree, read the books. You wont be disappointed. I need to get back into the fiction behind Halo, way behind on the books. Awesome theory, even for someone way out of the loop :-P. It makes sense that this is the kind of conflict 343i has been building towards, with the emergence of Requiem and the Forerunner stories hitting shelves over the last 2 years. Keep up the great speculation! this is the baddie for me. not in his forerunner state though. I tend to think he preserved himself as an AI, some what like Chakas to GS, but more powerfull. The orange glow suits that of a builder too.